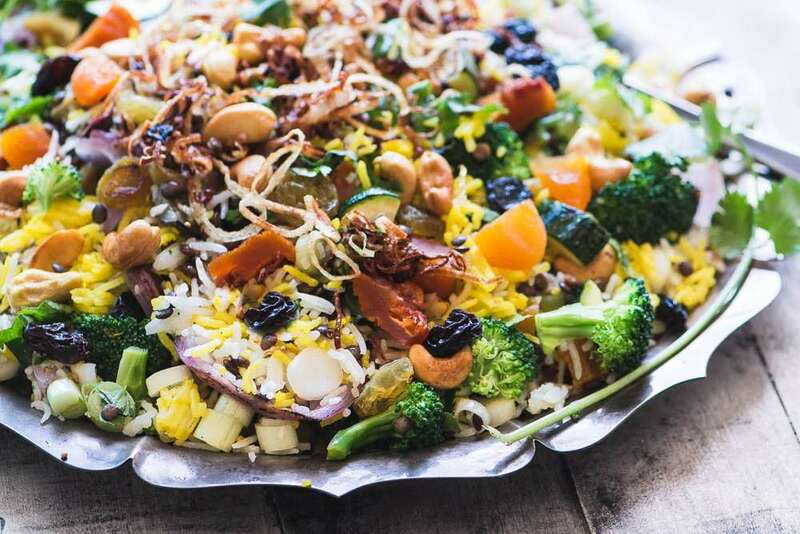 This Peach and Cashew Biryani Salad is a nice change from the same old barbecue side dishes ~ this easy rice pilaf is perfect for potlucks and parties. Whisk the dressing ingredients together, taste to adjust any of them, and set aside. Crush the saffron threads between your fingers into a small bowl and pour 1/4 cup boiling water over them. Stir and set aside. Toss the onion, broccoli, and zucchini and eggplant with the olive oil and season with salt and pepper. Arrange in a single layer on a baking sheet if you are using the oven, or a grill pan if you are grilling, and roast for about 5-15 minutes, or until charred and just tender. Cool slightly and then cut the veggies into bite sized pieces. While the veggies are roasting make the fried onions. Put a couple of inches of vegetable or coconut oil in a sauce pan and heat until quite hot, but not smoking, about 350F. Separate the onion rings from each other and fry, in batches, until golden and crispy, keeping them moving in the oil so they don't burn. Drain on paper towels and set aside. Coat the bottom of a small skillet with vegetable or coconut oil and toast the cashews, stirring almost constantly, until they are golden, about 8 minutes. Drain on paper towels and sprinkle with a little salt. Assemble the salad ~ put the rice in a large bowl and drizzle the saffron water over it (you just want to color some of the grains.) Add the lentils, grilled veggies, cashews, dried fruits, cilantro, and scallions. Toss with the dressing. Season to taste with salt and pepper, and serve topped with the fried onions.